Total Score: 9.00 + Editors Choice! Introduction: Perhaps the most eagerly anticipated reel of the season, the Shimano Calcutta TE DC is the stuff dreams are made of. This reel makes use of all the latest knowledge when it comes to design and technological advancement. If you had told me two years ago that a reel manufacturer would effectively employ a digital system into a conventional sized casting reel I would have bet against it, but it looks like its time to distinguish if Shimano's high tech gamble is really going to pay off. Impressions: When I first pulled the Calcutta DC out of the box my jaw literally dropped to floor. This reel is striking, you can examine this reel for an hour and still find incredible little details that make it impossible to wipe the grin off your face. 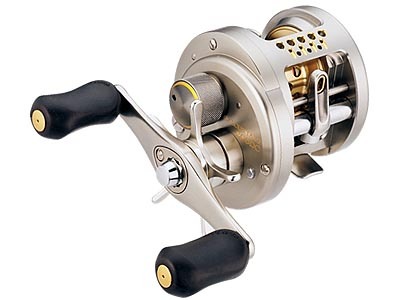 This reel makes use of the highest quality materials and components, no cheap plastic here. The reel feels extremely compact, and yet surprisingly solid. The Calcutta DC is matte silver in color, and the metal feels silky to the touch. All the knobs and porting on the reel are highlighted with gold accents, not only making it easier to distinguish key controls, but also giving the reel its particularly high tech good looks. The original Calcutta TE already set the benchmark very high in terms of refinement and quality, and yet the new Calcutta DC manages to surpass its sister reel in just about every category. The Calcutta DC sports the same size and profile, yet features a more advanced cast control system, more refined knob and drag adjustment, and actually manages to weigh in .03oz lighter! The Guts: When I first heard that Shimano had built a reel with an embedded digital system I was immediately skeptical on how small they could build a digital circuit, and whether or not Shimano could effectively guard the electronics from the elements. In fact, every pre-production reel I had the opportunity to open up had a completely exposed PCB. When we dissected our test reel we were pleased to see that Shimano has implemented shielding on both sides of the digital control board, and only the electric coils are now exposed. The system is classed as waterproof, but don't go about dunking the reel in water. Prolonged exposure to water will disable the system's sensors from making accurate reads. After we dunked the reel in freshwater it took about 45 minutes for the reel to regain full effectiveness, basically you need to wait for the miniature sensors to dry. 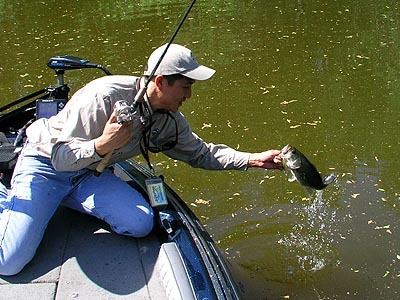 There are no batteries that need swapping, as the entire system is self energizing after your very first cast. The system was designed not only to reduce backlashes but also dramatically increase casting distance by making 1/1000 of a second adjustments via one of the eight pre-programmed settings you choose. The system can react so fast that it allows spool rotation to actually exceed 30,000 rotations per minute before applying the braking patterns. The Field Test: Does it sounds like science fiction to you? We decided it was high time to put the reel to the test against some fish who wouldn't care whether or not your reel is centrifugally controlled or plutonium powered, for that effect. We head out for a series of cast tests in a field and on shore, where the reel underwent over 2 months testing chucking an extensive assortment of baits in countless applications from shore and the deck of our bass boat. Casting: The main reason that the Calcutta DC is able to deliver such stellar casting is that the digital braking allows the spool to reach 30,000 RPM's before hitting the brakes. With conventional magnet and centrifugal cast systems the systems are always partly engaged, interfering with a 100% true freespool. 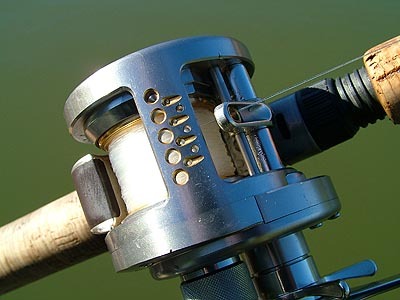 While these traditional reels have a operating range of anything from 15,000 to 20,000 RPM's the Calcutta DC can surpass this with ease, simply by turning on the brakes when only truly necessary. The total increase in ability to achieve maximum speeds is near 50-70% over Shimano's own current centrifugal offerings. How smart is the system? Don't make the mistake of thinking that the computer is going to monitor your entire cast for you. You simply cannot cast without contact with the spool and never expect a backlash. The system adapts quickly and we found that it significantly reduced backlashes, especially severe ones. The eight program settings are chosen via a recessed knob on the left side of the reel. Increasing the control to maximum will amplify the total braking force applied to the spool. We found that when casting small weightless plastics, or tossing into the wind a higher setting is warranted. 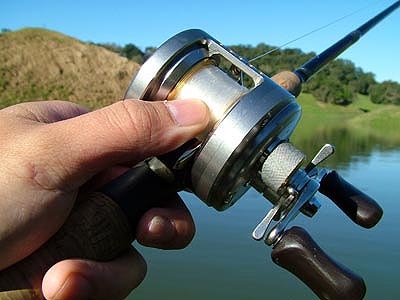 If you seek extreme casting distance for your cranks or spinners then by all means adjust the knob to minimum setting. The system is straightforward to use, and the results are brilliant. We were able to cast between 20-40% further with the Calcutta DC than with our favorite baitcasters. 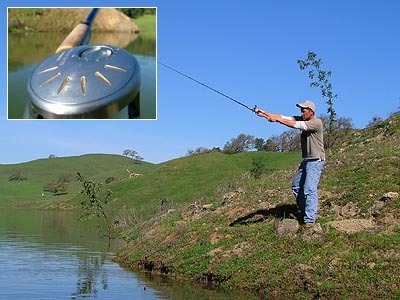 The only application that the Calcutta DC is not best suited for is short & low speed casts like pitching and flipping. Because the digital circuit is designed to maximize initial spool acceleration the braking is insufficient for low speed casts, and you will aggressively adjust the mechanical cast control or clamp down on the spool. Retrieve: High efficiency gearing gives even big bass and stripers little chance of escape as you can covert every single crank of the handle into fish turning power. For a round reel the Calcutta DC is very agile and you have exceptional feel with even your smallest cranks and lightweight plastics. During our field test I found that I could easily muscle mid sized bass and stripers, and had plenty of confidence when it came time to buckle down on bigger fish. The Calcutta DC manages to do all this without ever breaking a sweat, feeling silky and smooth at all times thanks to the use of 10 advanced A-RB Bearings in its complex makeup. Drag: Shimano's Dartanium drag design has proven itself offshore, and has been used effectively in its premium freshwater offerings for years. While the Calcutta DC uses the same fundamental drag as its predecessor, the drag control has been much improved. The older Calcutta GT featured a click-free star drag that was more difficult to make ultra-fine adjustments in drag pressure. The Calcutta DC features a larger more ergonomically shaped star drag knob that makes use of a precision clicker that is near identical in elegance to the Calais. 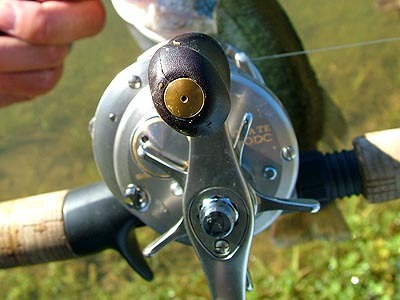 In terms of fish stopping power the Calcutta DC is second to none in comparison to other round reels of the same class. Ergonomics: The Calcutta DC has the same exact profile as the standard GT and sits amazingly low on the reel seat. This lower profile makes it effortless to palm the entire reel, making it ideal for ripping jerkbaits. 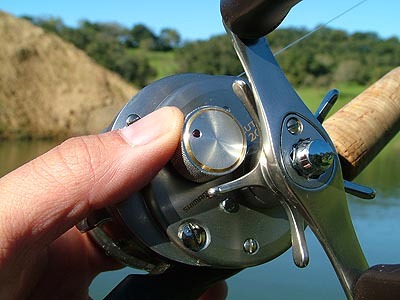 The 0.35mm micro pitch Cast Control Knob is easy to adjust on the fly, and features an audible precision click. A nice upgrade over the GT is the cold forged handle which is particularly lightweight and still offers 100% flex free performance. I was happy to see that Shimano stuck with their comfortable "power grip" knobs which are easy to maintain a solid grasp on, even when your hands or gloves are completely soaked. Finally kudos to Shimano for actually finding a way to upgrade the size of the adjustment knobs, implementing precision clickers, and still managing to reduce the overall weight of the reel below that of their already notable Calcutta GT. 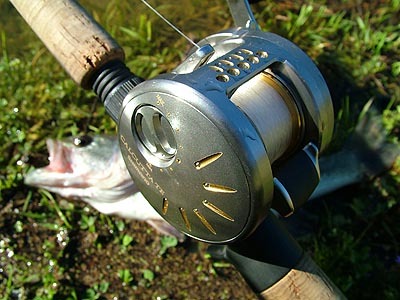 Durability: Now the question that we have all been waiting for, just how durable is this reel? The mechanical portion of this reel is just as durable as the GT, and the inclusion of Anti-Rust Bearings makes the reel saltwater capable. The electronics on this reel are properly sealed and during our tests, even after dunking, the reel continues to perform excellent. This reel requires no additional maintenance over purely mechanical reels, and the oiling procedure is near identical to the GT. When dissembling the reel to be careful not to allow anything to impact the PCB or physically damage the coils. Finally the one weakness of using electronics is that they are more susceptible to heat. Do not leave this reel in your hot car to bake, as prolonged temperatures above 158�F (70�C) will harm the circuit. Conclusion: This reel can benefit baitcasters of all levels. Beginners will enjoy a reduction of line tangles, while experienced casters will relish the boost in accuracy and total distance achievable with the Calcutta DC's advanced electronics braking. Shimano has a habit of bringing their technology down the spectrum and implementing once premium features into their entire lineup. Does that mean that one day we will see even their low profile baitcasters sporting the new Digital Circuit? Maybe. But until then if you fancy fishing the ultimate in casting sophistication the Calcutta DC is the only dish on the menu that can satisfy. Whether you are a die-hard baitcaster or a tackle enthusiast looking for the ultimate trophy, the Calcutta DC delivers the goods when it comes to refinement, quality, performance, and sheer innovation. While this reel bears one heck of a price tag, we have a feeling many a discriminating angler will be willing to shell out the green for an opportunity to fish this winning creation.